In New Jersey’s efforts to “rebuild” Governor Christie signed Executive Order No. 140 which tasked DEP along with the Office of Attorney General (OAG) to acquire easements for beach erosion, shore damage reduction and flood control projects in partnership with the U.S. Army Corp of Engineers and NJDEP as part of the State’s post-Superstorm Sandy reconstruction efforts. In this partnership DEP is the non-federal sponsor tasked with obtaining all necessary real estate for these projects. 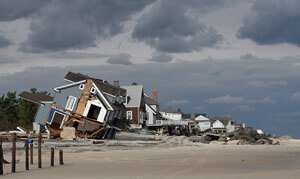 DEP and the OAG are working with New Jersey’s coastal municipalities to acquire all easements. Easements are being obtained voluntarily from those property owners supporting the State’s efforts. 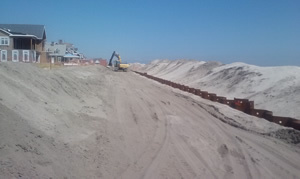 Prior to construction of protective beaches and/or dunes in the various project areas, the State will acquire outstanding easements in accordance with New Jersey law, and any just compensation due to the property owner will be determined in accordance with the State’s Eminent Domain Act. NJDEP Bureau of Coastal Engineering works directly with the U.S. Army Corp. of Engineers during the construction of these projects. Further information can be found on this website. The following is a list of the U.S. Army Corp of Engineers projects and the various municipalities that acquisition of easements is occurring. Note: For project details click the project name hyperlink to access the U.S. Army Corp of Engineers page.